In Provence, a bustling market happens in a different village each day of the week. Wednesday is Saint-Rémy’s turn, and Chula wouldn’t miss a visit even for a chance to chase a cat out of her backyard. At the market, Bob and I have our favorite vendors, and so does Chula. She has made friends with the man who sells sausage by the church. He gets a few tidbits ready when he sees her coming. Even after she tastes and says, “Thank you,” Bob has to tug hard on her leash to get her to move on. Since Chula likes to sniff as well as taste, however, eventually she meanders over to the spice table, stops by the big pans of paella, wanders into the flowers for sale, and even sticks her nose into the stinky soap crates. 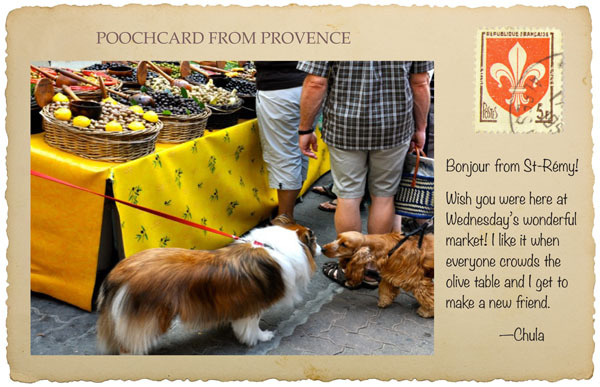 Along the way, she meets a host of other dogs, who also seem to find the market the best place to be on Wednesdays in Saint-Rémy. We can walk right out our door and, in three quick minutes, be on the ring road that encircles our village. Chula and I take a morning walk for croissants and baguettes. In the afternoons, we return, filling a market basket with whatever goods we need—a brush to tame her fur, a new Provençal tablecloth, maybe some stylish shoes. It’s all for sale in Saint-Rémy. On the shopping tours, Chula is on the lookout for new dog friends. It seems that other shoppers come with their best friends, too. Most stores will let the dogs inside, while others have a well-placed “hitching post” just outside. Either way, the message is clear: canines are welcome here. The biggest square in Saint-Rémy is Place de la République, and it’s often the site for the brocante, an outdoor market with old goods that are generally nicer than what’s sold in a flea market but not as nice as the offerings of an antique shop. While Bob and I pore over the goods on the tables, Chula checks out the treasures in her dog’s-eye view. 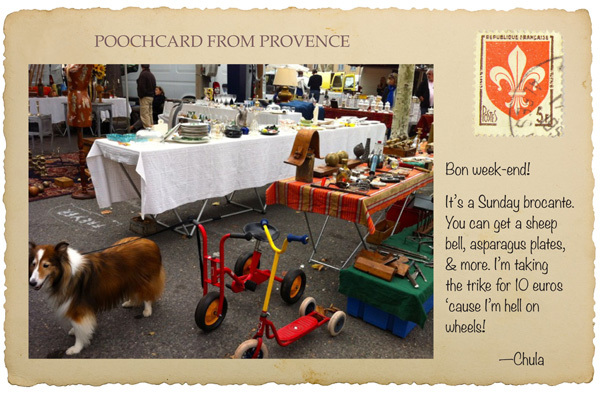 How thoughtful of the brocante dealers to set things right on the pavement and up a level! With something of interest for humans and dogs, Chula has many opportunities to make new friends. Unless there’s a brocante in town or it’s a festival weekend, the main square in Saint-Rémy is pretty quiet on Sundays. With a fall chill in the air, most people are staying inside. 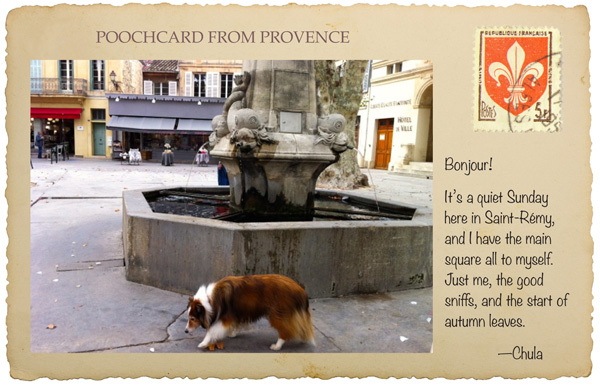 It’s a great day to wander and let Chula take her time sniffing all around the Hôtel de Ville (City Hall). Ah! 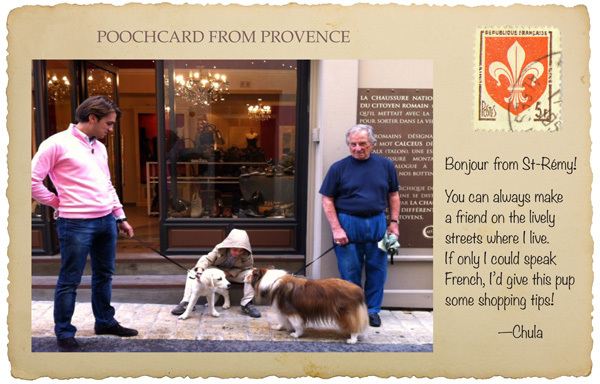 Whether a quiet Sunday or a bustling market day, it’s always a dog’s life for a traveling dog who just loves nosing around Saint-Rémy-de-Provence.